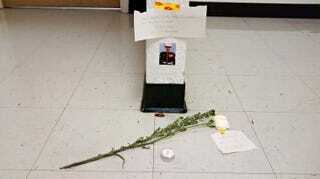 "Biology students are paying their respects to a fallen friend. Larry, a cockroach from the Life Science Building, has been dead for about a week. Students remember Larry as a "father of 100,000 and devoted husband," according to a note taped on a wall, above his dead body..."